If you’re short of space growing potatoes in containers is a great idea. Whether you own a tiny balcony, roof top garden or small urban patio or terrace you can grow your own potatoes. If you have had ever grown your own tomatoes you are aware of the fact that how fresh and organic, homegrown tomatoes taste like. Similarly, the soft, fluffy and young potatoes taste heavenly. The freshly picked spuds have the sweet and nutty flavor that you will not find in store bought potatoes. A potato that is replanted and used to grow potato plants is called seed potato. Buy seed potatoes from local nurseries or online. You can also use the main crop potatoes (table-stock potatoes) that you buy from supermarket or grocery stores to eat, but seed potatoes are best for this purpose as they are of great quality and come from disease-free sources. Also, note that supermarket potatoes are sometimes treated with sprout inhibitors to prevent the emergence of sprouts. 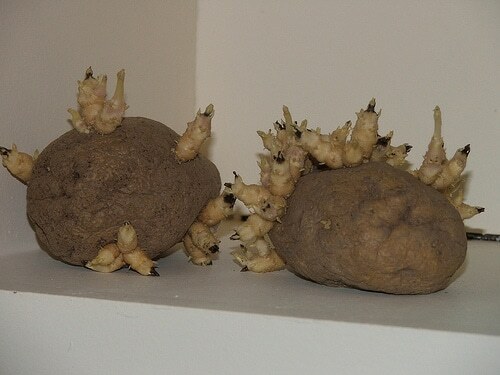 If you are unable to find the seed potatoes, plant the supermarket potatoes. For planting, select healthiest potatoes that are not bruised or rotting and appear free from soft spots. 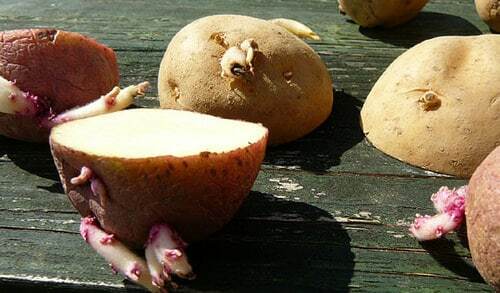 Once you have selected your potatoes, keep them in a cool, dark and dry place so that they develop eye buds (Potato eye is a dimpled spot in potato from where the bud appears and grows into a new plant). Check back your potatoes each day, once a few buds appear they are ready for planting. Pick potatoes with more than one eye buds. 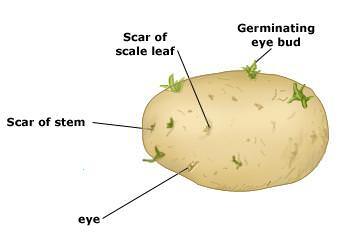 Remember the more eye buds will result in more spuds, but smaller in size. So keep balance and choose those that have 2-3 buds. Rub the rest of the eye buds or cut them deeply to remove them. *As you are growing potatoes in containers for a smaller yield you can skip this step if you want. 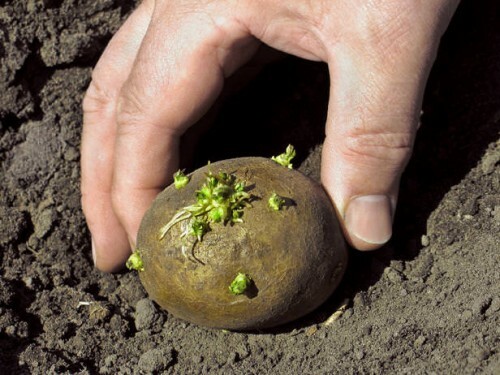 Cut the large seed potatoes (larger than chicken eggs) with multiple eye buds in half to get more plants. Once done, allow them to dry out so that the wound will heal for a few days before planting otherwise your cut potatoes will rot. When you are cutting the potatoes ensure both the sides have at least two sprouts. Read this informative article of Maine University on selecting and cutting seed potatoes. 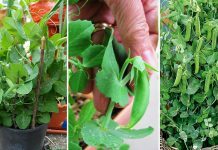 Pre-sprouting is not important and you can skip this step too, but if you are living in a climate that has short summer or if you want early harvest then it is recommended. In this step, 2-3 weeks prior to planting the seed potatoes are kept in a cool and dimly lit place with the eye buds facing up to develop sprouts. Choose a pot that is of at least 10 liters in volume (2.5 gallons) and 24 inches deep. A 40-liter (10 gallons) bucket can contain approximately 4 whole or cut seed potatoes (tubers). Large, black plastic colored buckets are recommended if you are growing potatoes in pots in a temperate climate because black color provides more warmth than any other color and plastic pot keeps the moistness. Potatoes can be grown in any type of containers, growing bags and even in polyethylene bags, dustbins, sacks, and tires. The container must be large and there must be sufficient holes in the bottom to drain excess water. Do not rush off to plant before the last frost date has passed. The soil must be sufficiently warm before planting potatoes, at least above 40 F (4 C). Fill the container up to only 4-6 inches with a quality soil. Place the tubers (seed potatoes) on top of the growing medium with the majority of the eyes facing upward. 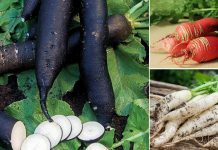 Now cover up the tubers with another 4-5 inches of nutrient rich soil. A rough estimate is that if your pot is 12 inches in diameter then don’t plant more than 3 tubers. Choose a location that is sunny and receives at least 6 hours of sunlight daily. Wet, clayey soils should be avoided. Light soils that are rich in organic matter is preferable. Growing potatoes require acidic soil with a pH level around 5-6. 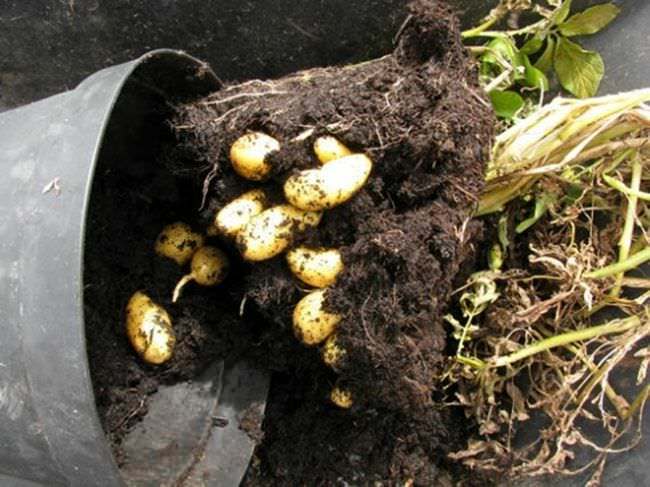 Drought and lack of water for the long period are detrimental for growing potatoes in containers. When growing potatoes, regular watering is essential. Keep the soil evenly moist but not wet. Potato is a cool season crop but it requires the frost-free period of around 75-135 days or more, depending on the type of variety you are growing. The optimum temperature for growing potatoes ranges between 45-80 F (7-26C). 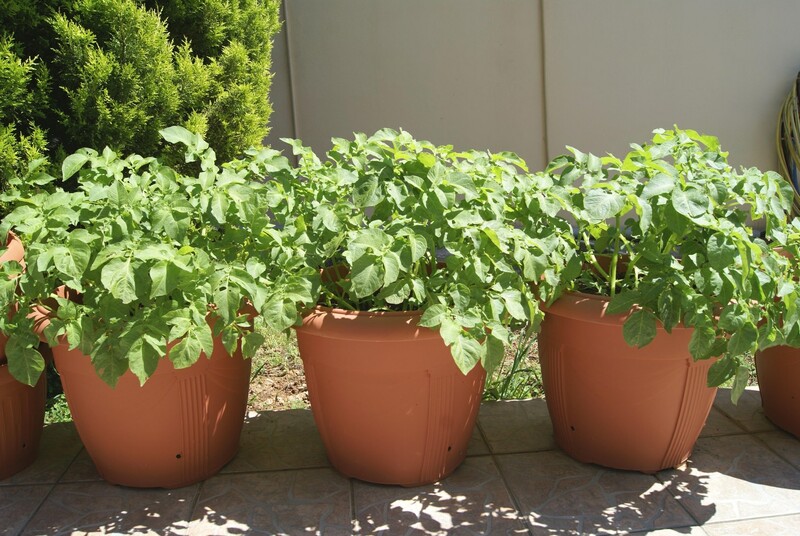 Growing potatoes in pots require some care and tricks to improve the productivity and flavor. When your potted plants grow up to 6-8 inches high, earth up the soil around their base until when only an inch of the distance left to reach the lower leaves. 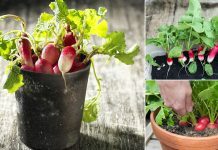 Repeat this process in every two-three weeks until your pot is not filled up to either 18-24 inches of soil depth or when only two inches of free space left to fill the pot. Don’t overfill the pot. You can use well rotted manure or compost instead of soil for hilling, this way your potato plants will get the steady supply of nutrients. Hilling prevents the developing potatoes from being exposed to the sun, which turns them green and bitter. It is important to know that green potatoes contain a chemical called solanine that is considered toxic. For growing potatoes in containers, natural fertilizers are sufficient. Add well-rotted manure or compost to meet the need of your plant. You can also apply organic liquid fertilizer once a month. Also, note that potatoes have high potassium requirements and too high nitrogen fertilization can be counterproductive and promotes foliage growth. The best way to avoid diseases is to avoid having a water stagnant soil and wetting the foliage. Plant quality seed potatoes and obtain them from the reliable source. Potato beetles, Aphids, Flea beetles are some of the common pests that may infect your container grown potatoes but you can get rid of them using organic fertilizers. There is no need to harvest potatoes before blooms appear and leaves are yellowed. But be careful, if you let the plant dry out completely it would be the sign that you have waited too long. Magical Eggshell Tea Therapy For Plants That Really Works! Proven!